As I was knitting this up I realized it was a bit tight and would not go over my heel, so I added 6 stitches total (3 separate increases) right before I knit the short row heel, then decreased them right after. This helped keep the spiraly striped thing happening (which I love actually). I think this pattern worked pretty well with the variegated yarn as it broke up the pooling just enough to make it an addition to the sock design. And I like how the socks match in their spiraly stripes! These are actually not as orange as they look in the picture. 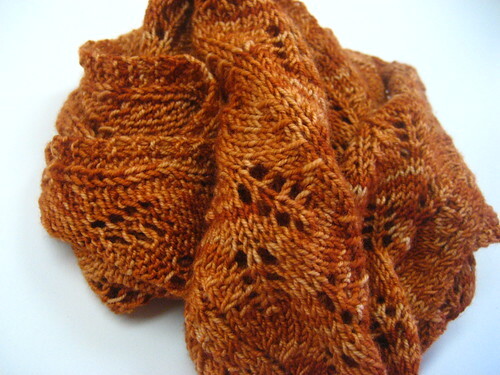 The yarn is Sundara Sock Yarn in the Spiced colorway – I absolutely love her yarn. The colors are just amazing!! These actually started pooling on me while knitting the leg, so I abandoned the ribbing called for up the leg and decided to just continue the stockinette and cable pattern as I like how its knitting up that way (the subtle flashes of color are awesome!!!). I found this yarn to be a bit stringy, although I’ve heard that it softens up after washing so I guess we’ll see. I am currently working on writing this up into a pattern and will hopefully have it out by the end of the month for a few knitters that have volunteered to test knit them for me. Oh, and Smooshy Sock is soooo yummy! I can’t wait to give the socks a nice bath (no I haven’t washed them yet – its too hot for socks here!!) so I can see how much softer the yarn gets! On the WIP front, I’ve almost knit up one arm of the Garter Yoke Cardi (I’ve knit this sleeve 3 times now!!!) and it finally fits perfectly, so almost finished there with just the other arm and sewing on the buttons. The Vesper socks are stalled as I’m not loving the pattern right now – may have to rip back again to the toe and just start over. 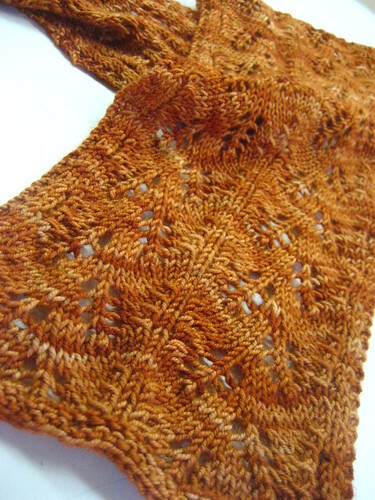 And everything else has been on hold for now since I’m trying to finish the Garter Yoke Cardi. 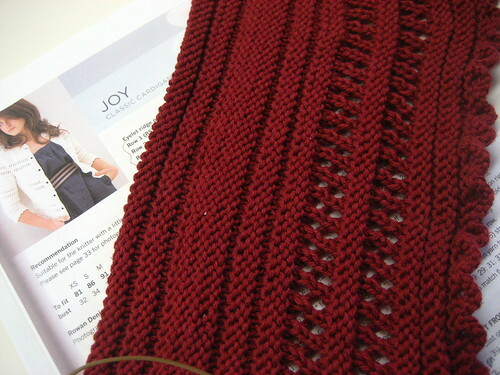 I really want to cast on for the Riding to Avalon Hoodie in the new Knitscene but I think I may try and finish all my WIP’s first then start something new (at least finish all the sweaters I have on the needles!!). 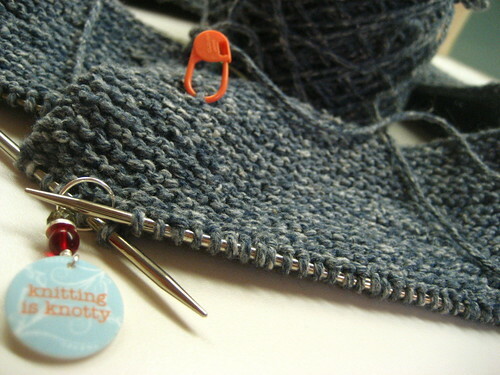 I think I eluded to a Garter Toke Cardi that my friend Elin and I were gonna start knitting together. 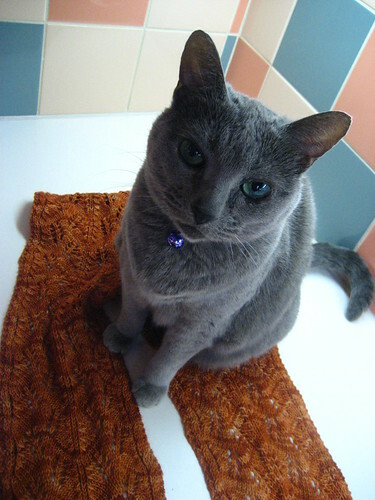 We are emulating Knittingdropout’s gorgeous cardi that she is currently writing a pattern for (raveled here). We couldn’t wait so we decided to go ahead and do the calculations ourselves and knit away! I’m through the waist shaping and I’m currently working on one of the sleeves (I have a fear that I’ll run out of yarn even though I still have 6 balls left). 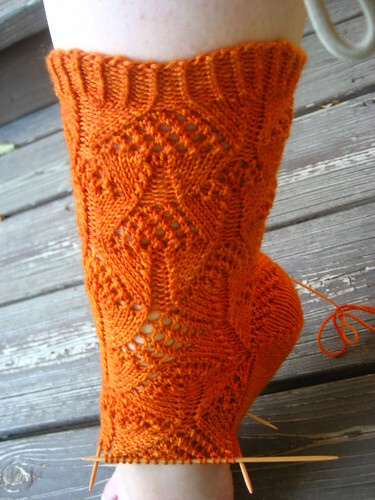 These are my V is for Vesper socks (raveled here). I might rename them once I get the design down pat. 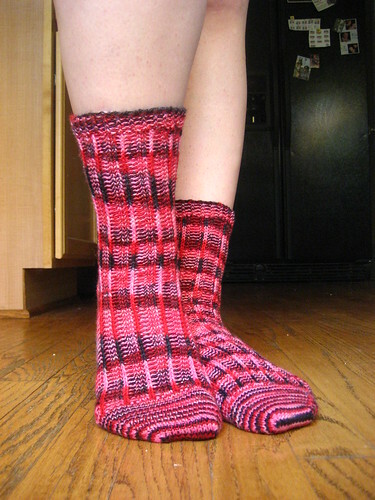 I really wanted to knit something a bit more interesting for self striping socks than just you regular stockinette, something that shows off the striping goodness and at the same time keeps the knitting interesting. Not sure if this is going to fulfill that desire, only time will tell. Oh, and am I the only person in the knitting community that doesn’t want to knit the February Lady Sweater??!! A scarf I will actually wear come winter…. Another WINNER!!! I absolutely love love love this scarf. 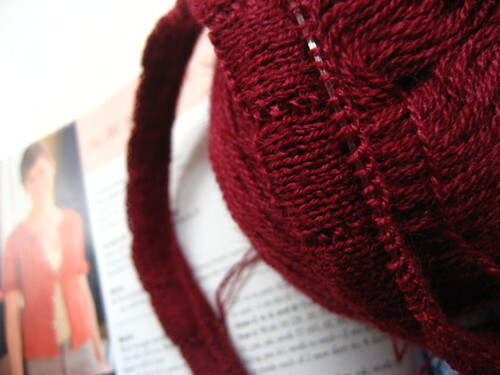 I fell in love with the Jitterbug Ginger Cinnabar colorway when I came upon it at my LYS, The Shabby Sheep. 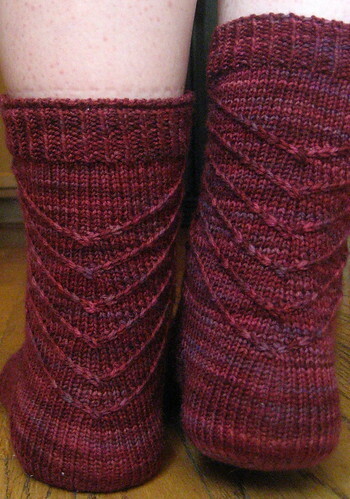 I knew it wouldn’t be enough yardage to make a pair of socks I liked (I like them long! ), so I passed it up several times but then finally sucumbed to the lure of Jitterbug (ok, I just had a major case of deja vu and felt that I had already blogged about this!!! Twilight Zone!!). And Jitterbug is amazing. AMAZING! Since I knit this scarf up I have purchased an additional 6 skeins of Jitterbug, enough to make knee highs if I wanted to (most of it on sale thank goodness). I mean how can you resist more of this yumminess?? 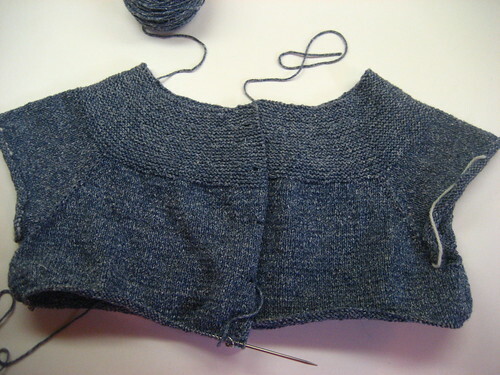 I made a few mods to this…I followed Elin‘s lead and knit the edges in garter instead of k1p1 ribbing. I also didn’t like the left- and right-leaning twist that the pattern calls for; instead I knit left and right twisting cables and think it turned out great! I’m woefully behind on posting FO’s!! I’ve knit a Helmet Liner for my dad and just took pictures of Sahara, just haven’t gotten around to blogging about them yet!! I also cast on for 2 new projects…have the pics for them too! They are both in cotton blends and my hands HURT! I will be taking a break from them for a day as I’m traveling to L.A. tomorrow for work. Socks will heal my hands, I just know they will!! Why am I all about !! !’s tonight?? This shrug turned out super cute! And very comfy and warm. I had started this way back in January but it got sidelined for several other projects. I also realized that I had knit the sleeves and started the collar on the wrong sized needles, so I had to rip both back. I finally picked it back up last month and realized after i had knit 4 inches in the collar that I had knit it in a 1×1 rib instead of the 2×2 rib that pattern called for! So I just went with it. I think it looks great, and now I don’t have 2 shrugs that look exactly the same!! My friend Jenny freaked out when she found out I had knit this shrug up as she is always looking for the perfect shrug – so I’ll probably be knitting her some soon!! On the WIp front, I’m almost finished with Sahara – I had to buy another hank of yarn as I ran out right before the second sleeve (argh!!) – I’m just praying the dye lots aren’t too off. I’m also knitting up a pair of socks for my sock pal for the Loopy Ewe Secret Sock Swap…I’ve just got the leg to go on the second sock! 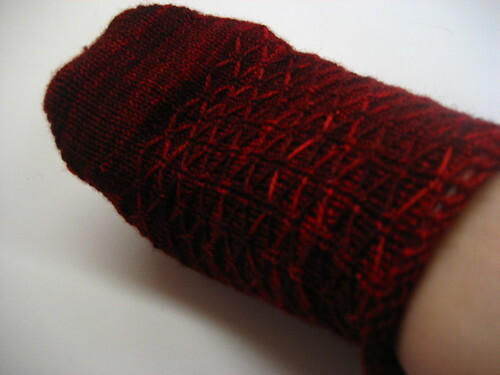 I actually knit one sock previously and it was waaaay too big, so i had to rip it out and start all over. Agggh! the power just went ouGt! hopefully it will come on again ASAP! So, I’ve been MIA lately. I’ve been knitting, but just getting back on my feel from an insane month of May. I was gone for half the month traveling, got sick from all the tree pollen in Northern California, and then woke up with a horrid crick in my neck after spending the night at my parent’s lakehouse for Labor Day. AGH!!! There have been good times within all the insanity…I celebrated my 33rd birthday on the 9th, and along with 2 other friends who also had birthdays within a week apart celebrated all together with an evening cookout – turkey burgers, homemade oreo ice cream (OMG!!! ), chocolate cake, lots of vodka and tequila shots make for a very memorable birthday! And last night we celebrated another friend’s birthday! We had sushi (my third time for sushi in one week!!!) and went to the gay bar for some dancing. What’s better than a country gay bar, I ask?? Love these socks!! Its too hot to wear them now, but they are absolutely gorgeous. I did have a bit of a hard time getting these to fit. 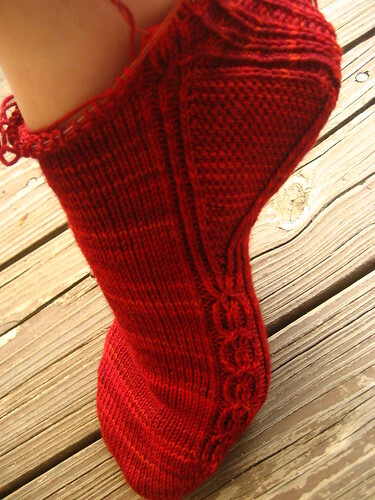 The first time I knit them I followed the pattern exactly and couldn’t get them over my heel without pulling and pulling and pulling. So I ripped the sock out and instead of increasing the instep stitches to only 31, I increased to 37 stitches. 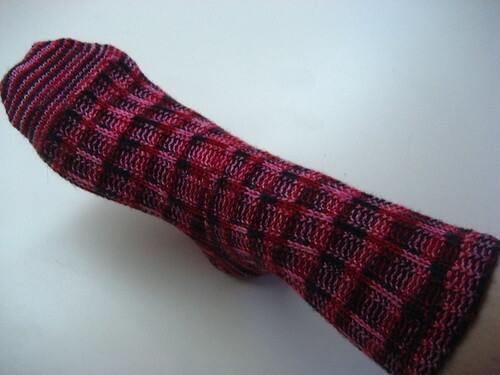 Pattern: 60 stitch toe-up stockinette sock. 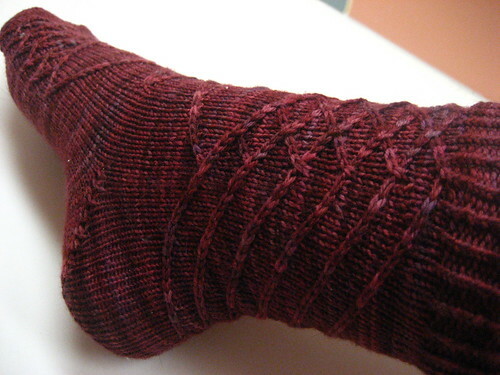 Turkish cast-on with afterthought heel and grafted bind off. 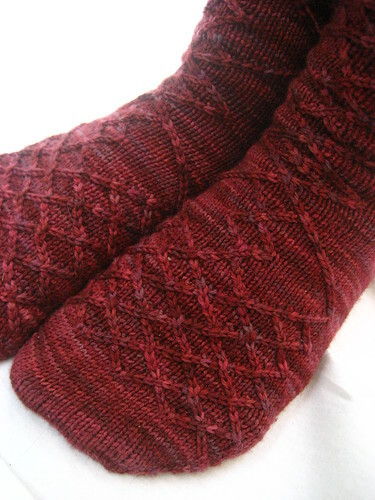 These were simple stockinette socks that I knit up while traveling and reading. Nothing fancy. 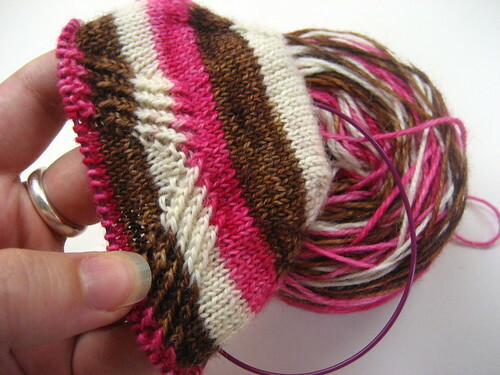 Love the yarn, love the stripes, love the socks!! 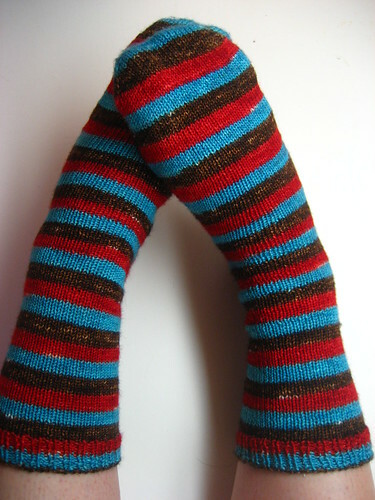 A few months ago my knitting twin Elin and I thought it would be fun to do a sock swap together. We email on a daily basis about all things knitty, with a little of personal life thrown in for some spice. I got my package from her about a week ago and feel horrible for not posting about it sooner, but my excuse is that I was out of town almost all of last week and since have developed this horrid hacking cough with green stuff, so I have been spending my time recovering. Anyway, here’s what I came home to! Look how gorgeous!! 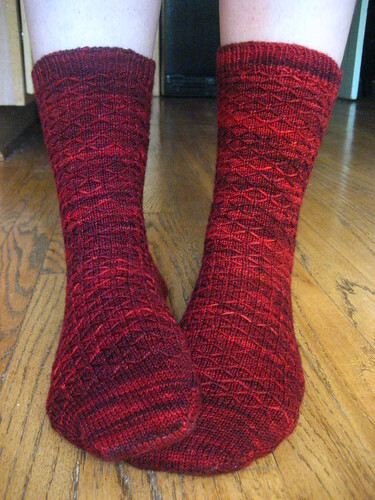 Its the Hourglass Eyelet Socks in Louet Gems in the Cherry Red colorway. They fit perfect! I actually wore the one sock around the house all day today all by its lonesome. Very comfy – I may have to get my hands on some more of that Louet Gems before too long (that is not until after I get some STR – those are next on my list!!) 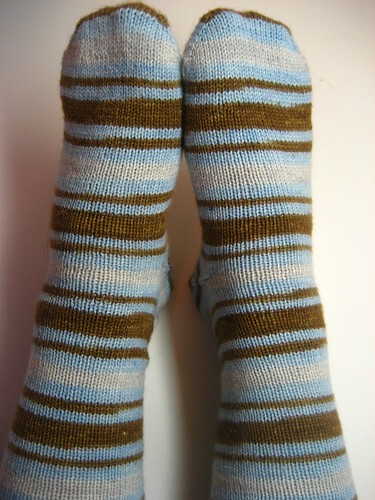 (hmm, I just realized that I do have some of that Louet Gems in my stash to make stripey socks!…or something). Along with the sock Elin sent me some yummy dark and milk chocolate (its practically gone already) and a lovely skein of Sundara sock yarn in the Delphinium colorway (you can see a pic here on Ravelry). Thanks Elin!! On the WIP front I cast on for Sahara a few days ago, but haven’t gotten far so I won’t bore you anyone with a lame pic. I also started and finished Otto, and will be writing a separate post about that. 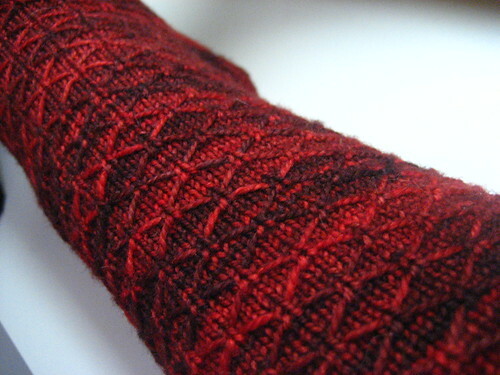 And I cast on for the Haruha scarf today, but again haven’t gotten far so I’ll post a WIP pic at a later date. 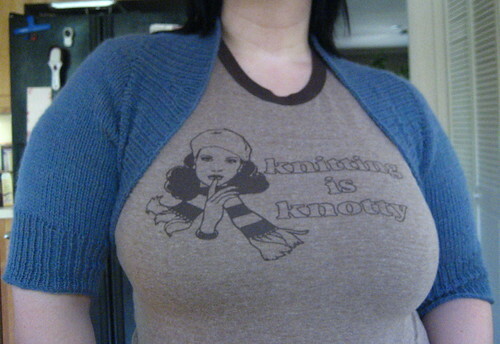 I have lots of knitting fantasies. LOTS. Cardigans. Pullovers. Socks. Even lacy stoles. My Ravelry queue is bordering on ridiculous. But I cannot stop myself! Once that perfect cardigan or sock pops up on my friends activity page, I have to add it. I have recently restrained myself from adding more sweaters (especially that turtleneck that just got added since I don’t really ever wear them!). How will I ever knit all these things?!?! 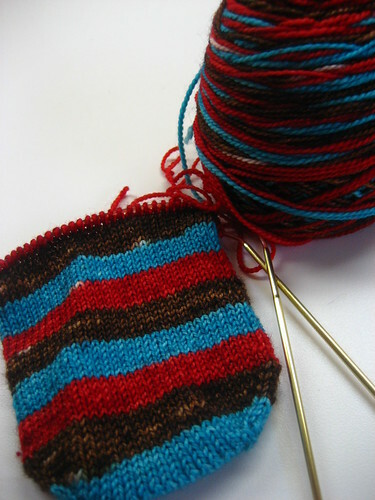 I’ve currently got 3 socks on the needles – the Leyburn socks which are giving me fits right now. I knit one and it was too tight. I got to the leg portion of the second and I had increased too much so they were too wide. I have now ripped back to the heel and hopefully will find the magic formula. 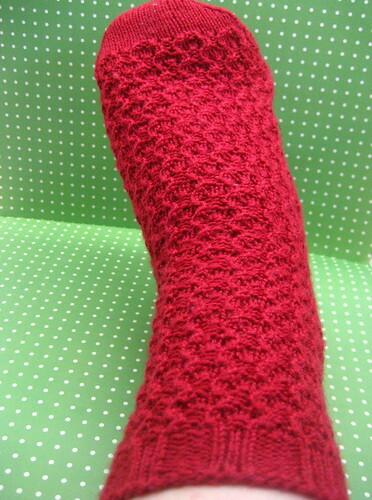 I also cast on for some socks for a sock pal. 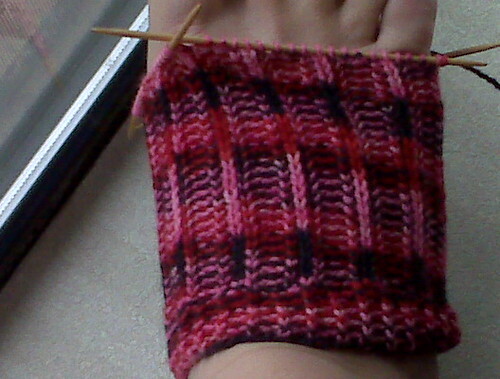 Can’t show pictures yet, but I’ve got one sock down and I think it may be too large too. Grrrr. In closing I’d like to show some pictures from my garden. 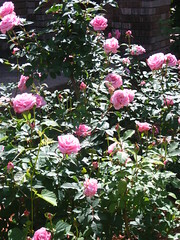 From left to right – Roses galore. 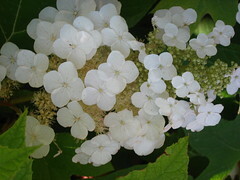 Japanese Hydrangea. 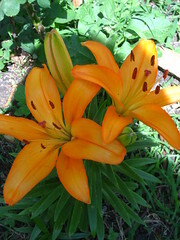 Lilly of some kind. 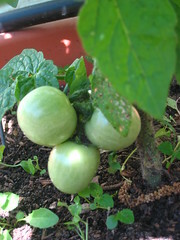 Tomatos. 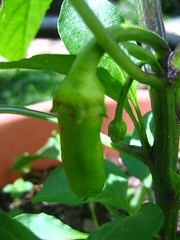 Banana peppers. 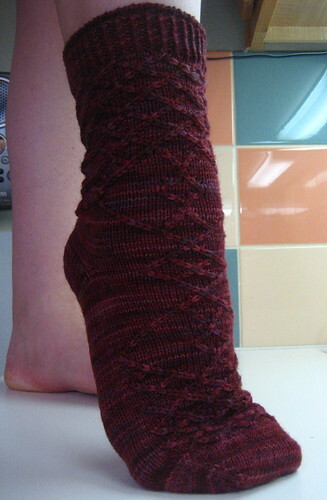 Mods: Turkish Cast-on (16 sts casted on), afterthought heel.